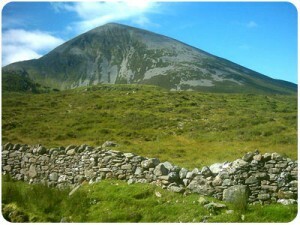 This Sunday, Reek Sunday, the CaminoWays.com team is heading to Westport to climb Croagh Patrick, Ireland’s Holy Mountain. Our Camino prep walk takes place on a very special date, with thousands of pilgrims visiting the Reek on this day. 10-Where to find us: We will have a CaminoWays.com stall at the bottom of Croagh Patrick so look out for us. We will meet there at 10am to start our walk at 10,30am. Croagh Patrick is just outside the town of Westport, in County Mayo. From its summit you can enjoy stunning views of Clew Bay with its 365 islands and the Mayo countryside. Pilgrimage to Croagh Patrick goes back over 5,000 years. It was also an important place for pagans who are believed to gather at Croagh Patrick to celebrate the beginning of harvest season.